Filling Removal, Chronic Mercury Poisoning, and Mercury Detoxification! 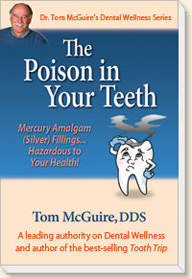 Written by Tom McGuire, DDS, one of the leading authorities on mercury amalgam (amalgam silver fillings), mercury detoxification, and chronic mercury poisoning, The Poison in Your Teeth explains why mercury amalgam (silver) fillings are hazardous to one's health. Over 150 million people in the U.S. have amalgam fillings and they continuously release mercury vapor, the most poisonous, naturally occurring, non-radioactive substance on earth. Mercury emitted from these fillings contributes to more than 100 serious health problems, including heart and autoimmune disease, chronic fatigue, depression and memory loss. Mercury from the mother’s mercury amalgams poisons the fetus and nursing baby and is a primary cause of autism. Most patients are confused, uncertain, or curious about mercury amalgam fillings and how they affect one's health. They also want an objective and insightful explanation about what to do about them. The Poison in Your Teeth is the best source of information you can provide your patients about this topic. This is the most informative and easy to read book on this subject ever written. It is a key element of my Marketing Program and if you haven't yet read it I encourage you to do so as I know you'll see its value and it will add to your background information on this topic. Plus, the best way to educate your patients on this topic is through a credible 3rd party source. For orders of 1 or more books outside the USA please call 707-829-7220. 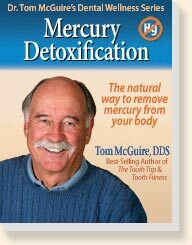 Members who are listed on Dr. McGuire's Mercury-Safe Dentists Directory will receive a quantity discount when purchasing Mercury Detoxification: The Natural Way to Remove Mercury from Your Body. This A to Z guide to safely and naturally removing mercury from the body is the most complete, practical, and effective book ever written on the subject of mercury detoxification for the layperson. But it is even more valuable for dentists who have been continuously exposed to mercury and are mercury toxic. It is also a great referral for patients interested in mercury detoxification. Click on the links below for more information and to order single books. 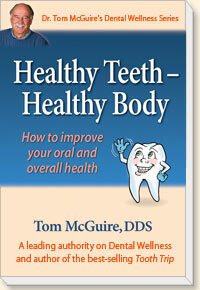 Healthy Teeth -Healthy Body: How to Improve Your Oral and Overall Health! Providing Healthy Teeth - Healthy Body to your patients is a great and cost-effective word-of-mouth practice builder. Simply provide it to all new patients and those who continue to have perio problems. 99% of your patients will never have been given this information before. This is a book that gets passed around, so be sure and stamp your contact information inside. Your hygienist will love it as an educational tool. For further information about how to use Healthy Teeth - Healthy Body to Make Patient Education Profitable, Click Here. The booklet contents are availabe on my website at http://www.mercurysafedentists.com/healthpro.html . I encourage you to read it as it will add to your background regarding the critically important relationship between oral and overall health. "We are all in this together and only together we can truly make a difference!"